The WheatNet IP Audio Driver is PC software that streams audio bi-directionally via an Ethernet port, enabling any computer used for any purpose such as program automation, storage or logging to become part of the WheatNet-IP network. The WheatNet-IP PC driver enables broadcasters to play audio throughout the entire WheatNet-IP network of studios and PCs without the use of soundcards. It emulates your soundcard through standard NIC allowing you to play and record on 1-24 channels and take advantage of 128 logic ports. Available in single-channel, four-channel, and eight-channel versions, the WheatNet-IP driver connects automation and other third-party systems to the network for streaming audio and any associated control logic, such as satellite network cues or for turning channels on or off. At 4.8 mb/s each, these drivers replace both soundcards and other hardware that would otherwise be needed for control logic functions. 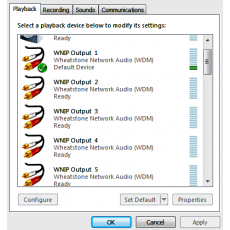 WheatNet-IP drivers can be installed on any PC, including news reporters' computers for recording and editing audio in the system and the program director's PC for listening in on the station programming or any audio source from anywhere there’s a connection to WheatNet-IP.